A hilarious fake menu posted on the domain name of Guy Fieri’s restaurant was apparently lifted word for word from some of Twitter’s funniest users. The programmer “hero” who registered the domain name for Guy Fieri’s restaurant—because Fieri apparently forgot to do it himself—then filled the site with absurd menu items like the “Honky-Tonky Double Barrel Meat Loaded Blast,” hasn’t been entirely forthcoming with the public. As it turns out, a few Twitter jokesters went on a run of tweeting bizarro Guy Fieri items in November, around the same time a damning New York Times review of Fieri’s Times Square restaurant went viral. Bryan Mytko, who registered guysamericankitchenandbar.com on Tuesday, was met with immediate praise. But it seems he lifted his jokes, word-for-word, from those comedians who beat him by three months. A deep fried snake attached to “a printed out picture of David Lee Roth,” called “Panamania!”? That one was @autisticpet. Mytko initially seemed to claim the credit for himself, tweeting “Guy Fieri didn’t register his restaurant’s domain name, so I picked it up. 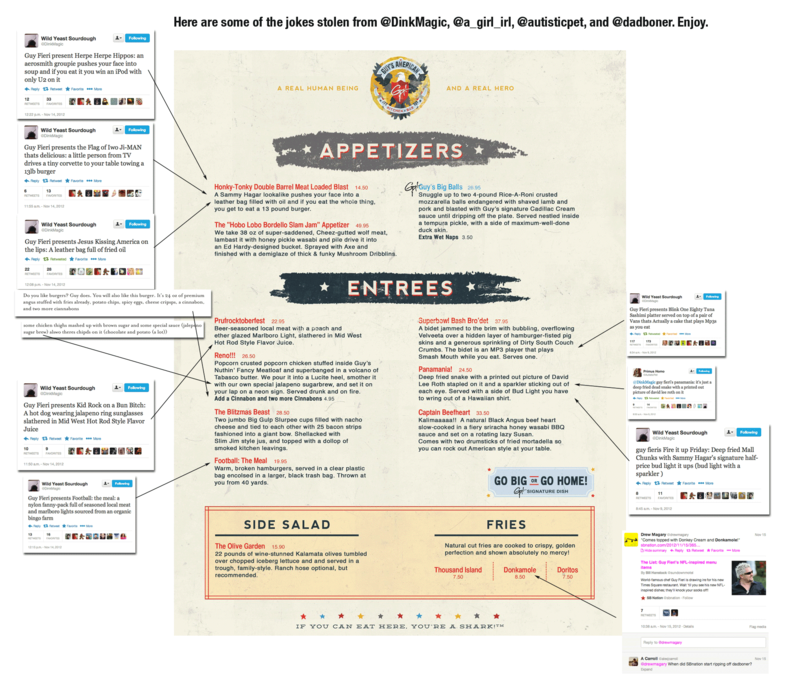 I think this new menu look great.” But weird twitterer @a_girl_irl wasn’t too pleased to see his compatriots go uncredited, and created a chart highlighting a dozen similarities between Mytko and other users. “haha a cinnabon and two more cinnabons? how do you come up with this stuff dude? its almost like someone wrote it before,” @a_girl_irl tweeted to him. Mytko finally acknowledged a few other contributions Wednesday morning, though he didn’t apologize. “Big ups to @a_girl_irl and @DinkMagic for the tweets. This has been a blast. I had no idea the stuff was theirs so just giving credit,” he tweeted. @a_girl_irl said the problem wasn’t using others’ jokes in a new format it, it was Mytko implying the jokes were his to begin with. “if he had credited it from the beginning i honestly would not have cared but he wanted to be the Big Funny Lone Genius,” @a_girl_irl tweeted.